Shop Classroom Rugs in A Huge Selection of Styles: Buy Now! Kids just love our rugs and carpets, and you will too! What kind of rug should you get for the classroom? Rugged, brilliantly colored and imaginatively designed, our top quality picture rugs, classroom rugs and great kids&apos; carpets will lay the ground for a rich and lively learning experience. Hertz Furniture&apos;s selection of classroom carpets offers way more than a soft place to sit. Choose from a wide variety of educational designs, solid colors and just for fun graphics. A great kids rug will transform your learning space, enticing little ones to come in and enjoy a positive educational experience. How can I make sure that my classroom carpet is durable? With all of the wear and tear that preschool, daycare and elementary school classrooms experience, it is important to make sure that they are furnished with the most durable equipment. Our classroom rugs come with reinforced backings and edges which protect against fraying and other damages. Many have double- or triple-serged edges. Which educational rug pattern should I get? Carpets come in both colorful designs and single-colored options. A colorful carpet can really liven up a classroom. It serves as both a decoration and a functional piece. Colorful options also make stains harder to see. Solid colors are also great, especially if you are coordinating classroom colors with furniture, paint colors or decorations in particular hues. A selection of shapes is available as well. The right choice will depend on the shape of your classroom and the area in which you want to place the kids' rug, as well as its purpose. 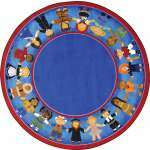 Oval and round rugs are perfect for circle time. They help young learners know where to sit to form a proper configuration so everyone can see. Squares work well in a book corner, where you want to cover a smaller area while still providing a cushioned reading space. Big rectangles are great for those large spaces in the middle of the room. What kinds of educational rug designs are there? 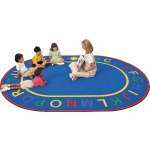 Educational carpets offer a creative way to teach a number of subjects and concepts, or to enhance your learning centers. 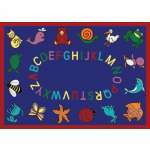 Our selection includes alphabet, numbers, colors and shapes designs which are perfect for teaching these units. Having an educational design in the middle of the room also encourages curious young students to take initiative and learn or review independently. Solar system and nature-themed designs are also available. 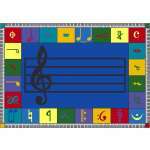 Sheet music and musical-symbol rugs are perfect for a music room or instrument area. They facilitate hands on lessons and teach students about the importance of this creative discipline. Young learners will just love sitting on them and trying to identify the various symbols and notes. You can also use an educational rug to teach important skills. 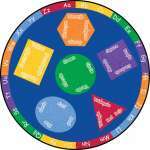 Our Map of America rug offers a fun way to teach about different states and map-reading skills. 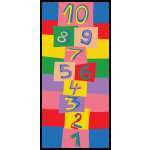 The calendar carpet is perfect for chart-reading skills and learning about concepts of time associated with days of the week and months. 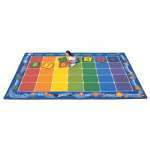 Colorful kids' carpets can also enhance activity centers around the classroom. Town, city and neighborhood graphics come in a selection of appealing designs and shapes. They offer an excellent space for playing with toy cars, trucks and other vehicles. Alternatively, students can choose to use them for imaginative-play scenarios with various figurines, use blocks to add their own buildings, or do all of these things at once. Don't settle for a boring rug that won't last. Hertz Furniture's huge selection of reasonably-priced classroom carpets is bound to include a number of excellent choices for your learning space. 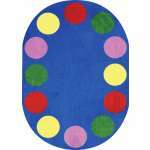 Our rugs come from leading manufacturers including Joy Carpets, Carpets for Kids and Learning Carpets. Don't hesitate to call Hertz Furniture today and spice up your classroom with one of these attractive, educational, colorful classroom accessories.